You are here: Home » Portfolio » Welty Environmental Ctr. Welty’s needs were fairly standard. They have educational programs that they need to more effectively communicate to their target communities. They need to reach, inform and effectively engage their target audience. The results they are looking for is increased program registrations, participation and membership. Finally, they need to be able to update their programs content, updates and calendar themselves as easily as possible. Resonate Web Marketing does more than simply build websites. We provided extensive consultation on content management, methods and options to maximize audience engagement, integration with other online marketing channels (social media, email etc.) as well as traditional off-line channels. We initiated, applied for, attained and implemented Google Apps for Non-Profits for them. This allows them access to the entire suite of Google Apps FREE of charge. You may know that Google apps are an incredible resource but can be cost-prohibitive for many for-profit enterprises much less non-profits. Welty now has this available to them for free. Owner access and control over their own content. Photo gallery implementation and much much more. The Welty Environmental Center provides year-round, hands-on educational programs for both children and adults in the areas of environmental and ecological education. 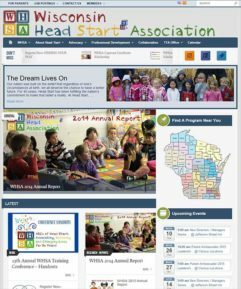 They are arguably the single greatest resource of it's kind serving the broader Wisconsin / Illinois bi-state region.